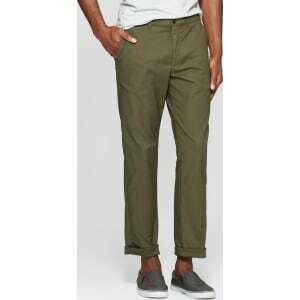 Men's Tech Chino Pants - Goodfellow & Co Late Night Green 34x30 from Target. a sleek, fitted look. Easily dressing up or down, you can pair the solid chino pants with nearly any type of top, from T-shirts to button downs, for versatile styling options. Size: 34x30. Color: Late Night Green. Gender: Male. Age Group: Adult. Material: Cotton.